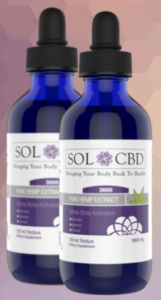 SOL CBD’s high CBD concentrate tincture is perfect for those that need a higher dosage. This bottle contains 3X more CBD per dose than their other tinctures. 3600mg per 120ml bottle. Their carefully, CO2 extracted hemp CBD contains a full spectrum of phytonutrients, enzymes & vitamins. This mixture is pure hemp extract combined with a hign concentrate MCT oil derived from organic coconut oil.